In case you missed it, last week I started a new official feature where I will be posting book aesthetics every weekend. They might be of a book I’m currently reading or recently read or read a long time ago or one I consider to be a favorite of mine—there’s no rhyme or reason to it! For now I just want to keep it simple and feature all different kinds of books (but there might be themes in the future). For my second Weekend Aesthetic, I’m featuring Maggie Hall’s The Conspiracy of Us. The Conspiracy of Us is the first novel in a fast-paced, international thriller series. What I loved most about this series is that each book gets better and better as Avery dives deeper into the world of the Circle. Interested in finding out more? Author Maggie Hall stopped by the blog for an interview last year! What do you think of my new weekly feature? 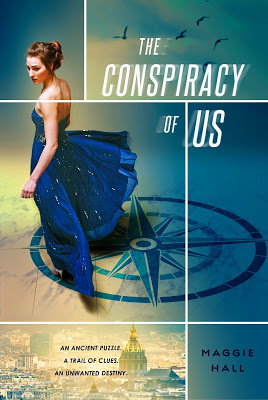 Have you read The Conspiracy of Us trilogy? Love the aesthetic! Makes me want to read the book! Thanks, Jenn! It’s a fun series so I hope you get the chance to check it out! Thank you so much! I love the way the colors pop next to each other! Thank you, Carol! I love making them and I’m so glad I get to share more of them on my blog!